There are lots of great albums in the Australian Jazz Discography. Some of them have gained a well-deserved iconic status and are often cited as works of art that define the sound of Australian Jazz if there is one. 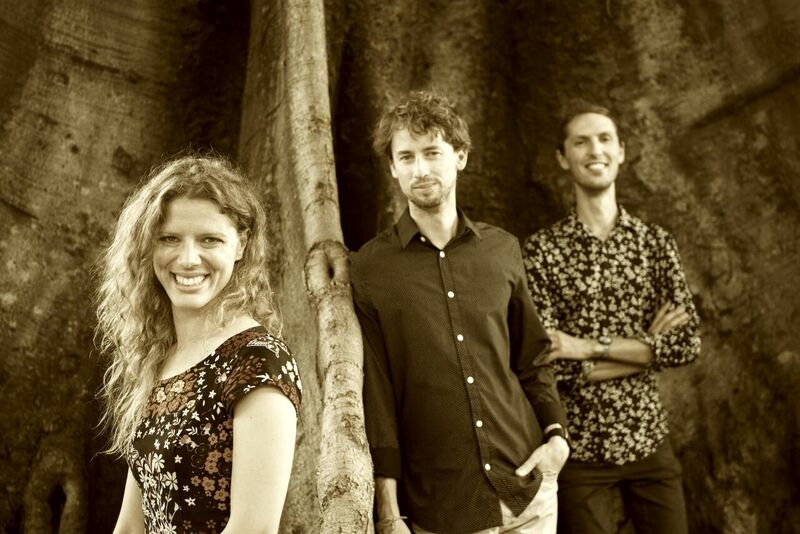 But very few can be associated to the very notion of being Australian, as does‘Hope in my pocket‘, the album just launched by vocalist Kristin Berardi, pianist Sean Foran and saxophonist Rafael Karlen. Inspired by the point in history which played arguably the most significant role in the creation of the Australian national identity, the Anzac Gallipoli campaign, they came up with a set of very emotional songs, merging different traditions, from jazz to folk song, to classical, performed with a rare kind of lyrical sensitivity. Currently on tour to launch the album, Kristin Berardi and Sean Foran took some time to answer a few questions. AustralianJazz.Net: How did you come up with the idea of ‘Hope in my pocket’? Kristin Berardi: It all came about because the three of us did some gigs together, and we really enjoyed the special connection we shared. We’ve known each other for years, however we’ve all done many different projects with different people. We wanted to make more music together, and then Sean asked us if we wanted to apply for a project to do with the Anzac Centenary. We had wanted to record an album and thought that a concept or theme for the music would suit really well; so, when we found out about the ANZAC centenary, it just seemed right. AJN: What does the title stand for? KB: ‘Hope In my Pocket’ is the title track; the song is about having a photo in your pocket; only you know it’s there. Whether it be someone at war, or someone waiting at home, it gives them hope that they will see their loved one again. AJN: How did you work on this project? KB: First we all went to the State Archives in Brisbane, the State Library and online and we read letters from the War Memorial in Canberra. We all took note of specific stories, or feelings that strongly affected us. Then we all went away and sat with these stories or emotions, and each began to compose some works. Then we would meet and share these with one another. Some were finite in creation, and others were fragments and so we would work on these together til their completion. With the pieces that Sean and Rafael composed, they would tell me the stories they were influenced by, or the theme or emotion they were based upon so I could sit with the music and see what words would flow. Luckily the music came together as a trio quite easily. I think we all shared a similar view on how we wanted to present the stories, so a strong group sound came out. AJN: How did this project affect you? KB: It was a very intense process and I still find it very emotionally draining each gig, as the content is just so real and so human. I felt very honoured to be reading these letters and gaining an insight into something that I would not have embarked upon, in terms of my own individual searching. I am reminded again and again of how fortunate I am to have spent this time looking into this in more of a real way, being able to develop more empathy and compassion, and yet of course, never quite understanding it all, as we are just imagining what it would feel like to be in these situations. I am now closer than I have ever been to the word ‘Anzac’, rather than it being such a removed topic – one faced mainly on ‘Anzac Day’, when as a kid you would line up and march with your school mates, honouring those who served, and fought for us all – but not really knowing what much of that meant. In no way did any of us want to honour or glorify the concept of war, so we were quite burdened with the seriousness of the task at hand: honouring historical happenings and yet not promoting any view in particular, but putting a voice to these concepts and people’s experiences from this time. AJN: What does the ANZAC centennial mean to you? KB: To me it gives us an opportunity to look seriously at these happenings 100 years ago and give thought to how we will respond now to similar situations – be it fighting in war, to equality and prejudice both at war and upon returning, support for loved ones left behind etc. It also means finding more meaningful ways as individuals in which we remember and acknowledge our history and perhaps what other parts of our history as a nation we need to be honouring and acknowledging. AJN: What does being Australian mean to you? How do you perceive your national identity? KB: Upon returning from overseas many years ago, I was in Cairns airport and I remember so clearly when going to my transfer gate, walking past an elderly Aboriginal woman and thinking how amazing her face was – her features, how no one I had seen in my travels had looked like her and how she and her people are very much a part of me feeling Australian. Being Australian means I am born in the nation of Australia and I hold our native people in highest regard and respect. I think we should be celebrating one the world’s oldest continuing civilisations on earth. My father is Italian and my mother Anglo-Australian and I like to celebrate the many different cultures and people which share their cultural differences relatively freely in this place. I enjoy our relaxed nature as a people generally, and our incredible expansive and geographically diverse land. Being Australian to me is a mixture of the natural beauty and diversity, the Aboriginal culture and people and the many other cultures, which are represented here on these shores. AJN: What are the unique features of Australian jazz? KB: Australian jazz has a distinct sound and approach. I think we are able to take influences from other kinds of music and mold them into our own, which is exciting and refreshing. SEAN FORAN: I would agree with Kristin but also add the influence of distance. We’re so separate from everyone else, and this has really helped us create our own music. I’m certainly heavily influenced by Australian musicians and I think there’s a real Australian sound – and it’s damn good! AJN: Your sound incorporates different features, mainly borrowing from the folk song tradition. Was this deliberate? KB: How the songs came out was very much because of the content we were dealing with. We didn’t have a preconceived approach to what the music would sound like, but yes – the feel of the album is definitely more ‘folky’ than ‘jazzy’. SF: I think that the three of us are also influenced by so many genres that it seemed natural to represent that in the music. I enjoy pushing the ‘jazz’ sound and concept into different places and think about creating some music that uses the most interesting elements from various genres. AJN: The lack of bass and drums in your arrangements gives the album an ethereal, aerial quality. Do you agree? SF: Yes, definitely. It happened naturally, I suppose, given the nature of the band. But it’s really something we wanted to focus on. The content of the music, the intense themes needed space, and we wrote in a way that gave them that. I was also really conscious that we could create some beautiful harmonies with the three melodic instruments, and this would be a strong dynamic and emotional tool. Also, the amazing recording (by Mark Smith), with a fantastic piano really heightens the ethereal quality to the music. AJN: Can you describe the relationship and dynamics among you three as a group? SF: It’s pretty tense… terrible being on tour together… No, I’m kidding. Really, it’s a fun group. We’re all quite similar in how we approach music making, yet our compositional concepts are varied, so it makes from some really interesting content from the start. As for the vibe in the band, it’s just fun. We all feel really connected to the music, and quite lucky to have the chance to make music with this meaningful content. Because we’ve all known each other for a long time it’s all quite relaxed. SF: Phew… tricky! my current state of mind is one of ‘searching’. I’m working on some new music for the trio TRICHOTOMY and I’m pulling out all kinds of new ideas. I guess the song that may describe this is Lars Danielsson’s “Tarantella”.